It is most popular in the countries, United States & Canada. 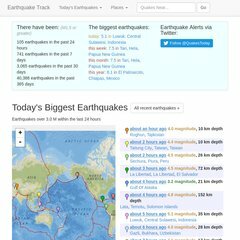 Topics: Today, Big Quakes, South America, Se Asia, Europe, & Asia. earthquaketrack.com Earthquakes in Orkney, North-West, South Africa - Biggest .. The estimated 1,591 daily visitors, each view 1.50 pages on average. Its local IP address is 50.57.106.47. It is hosted by Rackspace Cloud Servers (Illinois, Chicago,) using nginx/1 web server. Its 3 nameservers are a.dns.gandi.net, c.dns.gandi.net, & b.dns.gandi.net. PING (50.57.106.47) 56(84) bytes of data. Website load time is 411 milliseconds, slower than 95% of other measured websites. As well, a ping to the server is timed at 12.8 ms.